“For me calling at Bulgari’s shop is like visiting the best exhibition of contemporary art”. Every Bulgari creation is permeated with a spirit of excellence, hence the attention to detail and the search for absolute quality, typical of each product, coexist with a yearning for surpassing oneself and responding passionately to the ever changing market's requests. The Bulgari jewels take shape as a watercolor or tempera drawing. The subsequent transformation of a drawing into a finished jewel is left to the skilled hands of the artisan, whose job is to produce a jewel of extraordinary softness, roundness, polish and perfection. From the very first drawing, the idea is analyzed and developed creatively so as to assess the materials and colours that are most suitable for its creation, wearability and coherence with the Bulgari tradition and style. An internal workshop has been created with the aim of developing the jewellery collections on the basis of the Bulgari excellence and quality criteria. Furthermore, in 1996, in order to offer the ultimate service to its clientele, Bulgari created a Bulgari Gemmological Centre, providing gemmological certifications for most major stones mounted by the firm. As far as watches are concerned, Bulgari succeeded in combining a refined design with sophisticated mechanisms, produced and examined according to strict and rigorous Swiss certification criteria, a guarantee of high quality. 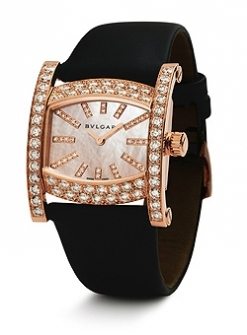 All Bulgari watches are created at Bulgari Time in Neuchatel, Switzerland.